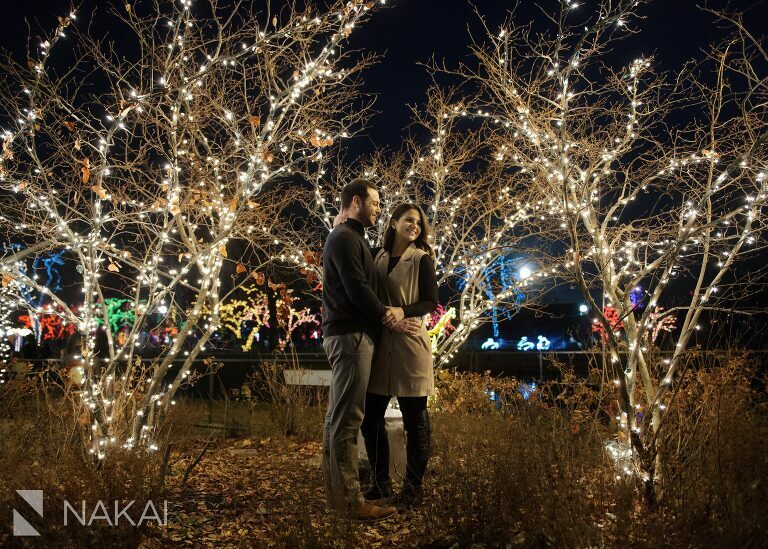 Zoolight Engagement Photos // Jamie + Aric! Creative Chicago Engagement Photos with Zoolights! The weather during the first week of December was insanely warm! (Hello global warming?) Jaime + Aric took advantage of the 50+ degree day to take some photos around Chicago…finishing off their session at the Lincoln Park Zoo’s annual Zoolights! A quick shout out to Jan Ehrenberg from Parties, Events + More for referring this wonderful couple! Can’t wait to work together next year at their wedding! I think we were all surprised, but not surprised by how crowded the zoo lights were on a Sunday evening with 50+ degree weather. So we decided to take most of our photos away from the crowds of people! 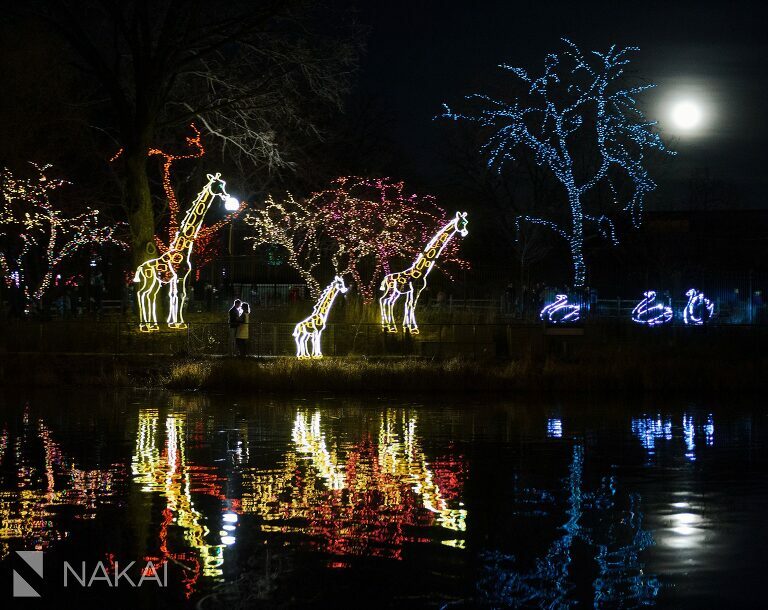 Here’s a photo of the engaged couple with a few Zoolight giraffes and a supermoon! Such a romantic photo with the Zoolights! As an engagement photographer, I always love creating new creative images for my clients! As much as I loved taking photos with the zoo lights, some of my favorite photos came from this location! It’s one of my things as a photographer…to know some really cool off the beaten path places to take engagement pictures in Chicago! Definitely the Chicago Skyline without being cliche! As a creative photographer, I love the juxtaposition of the strong steel geometric shapes and the soft grass of nature with a sweet embrace in the middle! I’m a photographer who loves sun flare. I try to photograph it anytime I can! Love their smiles – and the colors and textures in the background! Nothing says Chicago like the EL train tracks! Such a romantic photo with the Chicago skyline in the background! One last photo with the honeycomb…and the Chicago skyline! Jamie + Aric – I’m so glad you decided to have your session in December! It was such a beautiful day for photos! Can’t wait until your wedding next year! « Fall Westin Ohare Wedding Photos // Tanya + Christian!